I admit, I am not good about eating all of my vegetables. It is not that I don't like veggies, I do, matter of fact, I love them. However, I lead a very busy lifestyle and often times I don't have the time to sit down and eat a full meal in one sitting. To solve this problem I have turned to home juicing and have been making my own juices and smoothies. The following juicing recipe and photo is courtesy of the Supercharged Juice & Smoothie Recipes Cookbook by author Christine Bailey who is a licensed nutritionist. Thank you for sharing it with my foodie blog readers and myself. If you’re looking for a healthy pick-me-up for flagging energy levels, try this invigorating iron-rich juice. Both watercress and parsley provide iron and b vitamins, such as folate and b12, which the body needs for healthy red blood cells, and for mental and physical health. 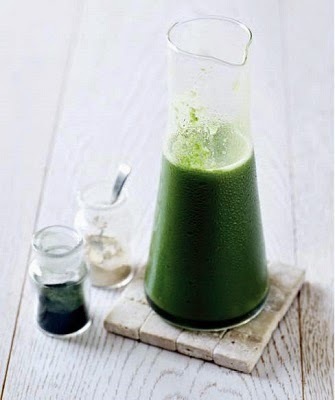 Put all the ingredients, except the Panax Ginseng and Chlorella, through an electric juicer. Stir in the Panax Ginseng and Chlorella, and serve immediately. I a good about fruits , but not as good about vegetables. This would be the perfect fortified juice pick- me- up for me.